← Universal Model Science Millennials Class Online Thurs. June 1! Jamie Martin, author of the book pictured above and blogger over at simplehomeschool.net, is hosting the Read the World Book Club once again this summer, just like she did last summer. I encourage you to buy her book that is the backbone for the club, pictured above, in Kindle or paperback. Then use it to find books to read loud to your kids, or encourage them to read independently, this summer. The summer book club is super low-key. 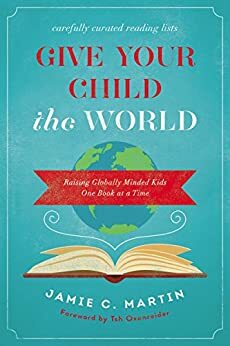 It basically gives you the idea to read books each week that are listed in a theme-based chapter in the book, so that you “travel” around the world (in your mind, as you read books based on Asia, Europe, Africa, etc. Each chapter is full of stories/books based on or in each continent around the world.) You can get more details and register here. I found some great books to read aloud to my kids last year that gave me fond, lasting memories. I can’t wait to discover some great new books this summer! You can come up with your own incentives to give to your children for reading, and use the printables provided by Jamie when you register here. Happy reading!